The Crypt at St John’s contains a number of community enterprises, including our Community Art Room. This is the home of St John’s arts programme and holds regular classes for all experience levels. We offer a range of courses that are practical and designed to get you started if you are a beginner as well as offering those who are already familiar with their chosen craft an opportunity to build on their skills and try new techniques. Classes are limited to small groups so attention is ensured. You will be taught through demonstration, group and individual instruction and hands on experience. All the tutors are experienced artists and teachers. The classes cover a range of skills and techniques together with an understanding of safe studio practice. Morning and evening classes cost £16 (£14 concessions) per session; all day classes £65/£40. Basic materials and equipment are included. Attendance must be confirmed by booking in advance please. 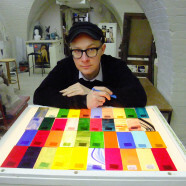 Mosaic Making with Alex McHallam: Tuesday evenings 6.30-9pm.